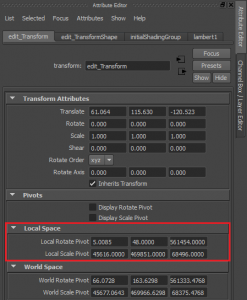 Previzion is set up to use editable transforms for control of certain scene parameters. This means that Previzion reads and stores the pivot information of nodes. A clean transform is one that has a local pivot of 0 on all axes. There are two ways of knowing if a transform is bad, first in Maya and also an error message on Previzion scene load. Under each node, in the transform tab of the Attribute Editor, there is a tab called Local Space under the Pivots. These are the values that Previzion reads to store the nodes local coordinates. 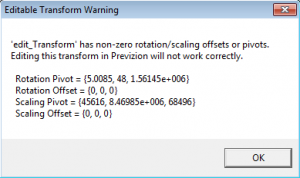 When loading a scene with bad transforms into Previzion a pop up will come up telling you which editable transforms have non-zeroed pivots. These can be “OK’d” and Previzion will still run properly without any issues, other than odd pivot points for objects if edited in Previzion. In Maya it is very simple to fix bad transforms. If your node has a very precise pivot point, where you’ll need to rotate or scale the object, you’ll need to do a couple steps. Record your 3 World Space pivots(Both lines should be identical). Translate your object to lock on to the origin at 0,0,0. Go to Modify > Freeze Transformations. Go to Modify > Reset Transformations. Move your object back to the recorded 3 World Space pivots. These can just be typed into the Attribute Editor by hand, in the Translate section of the Transform Attributes. If you just need your scene to load and aren’t intending to rotate or scale the object on a certain axis just do Steps 3 and 4.